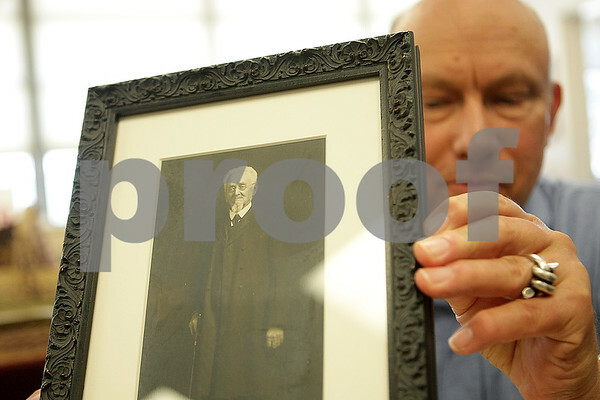 Historian Steve Bigolin holds a photograph of Jacob Haish taken in 1915 at the DeKalb Senior Center on Grove St. in DeKalb on Monday, July 7, 2104. Bigolin received the photo from Shirley Nehring while he was helping her sort boxes from the bank building at 2nd St. and Lincoln Highway, now the DeKalb Chamber of Commerce office, after her husband Paul M. Nehring died in 1999. Haish was 89 years old in this photographed and died on February 19, 1926, just shy of his 100th birthday.